A council is to take legal action against a developer who demolished a Grade II listed building. 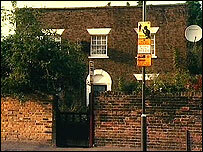 The 1826 Georgian house in Windmill Lane, Newham, east London, was razed after it was sold at an auction for £400,000, BBC London has learned. The demolition has angered local residents and a campaign has been set up for Angel Cottage to be rebuilt. Newham Council said it was seeking to serve an enforcement notice to have the building reinstated. The council said it will also seek to prosecute the owner of the property and those responsible for the work. A council spokesman said: "We are taking this case very seriously and will work with English Heritage to also serve a listed building enforcement notice that will seek to have the building reinstated. "Police have also been made aware of this incident." English Heritage said it was "dismayed to hear of the demolition" of the building over Saturday and Sunday. "The charming late-Georgian cottage was one of the last precious pre-industrial buildings from the time when Stratford was a rural retreat, not yet reached by the newly invented railway. "Its loss is a great one for Stratford's heritage." Resident Janet Dooney said Angel Cottage had been a familiar sight for most of her life. "I could have cried," she said. "I've lived here most of my life and that's what I've seen everyday. It's just a shame, I'm still gutted." The owner of Angel Cottage was unavailable for comment.